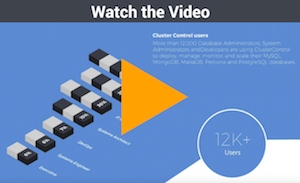 ClusterControl reduces complexity of managing your database infrastructure on premise or in the cloud, while adding support for new technologies; enabling you to truly automate mixed environments for next-level applications. Since the launch of ClusterControl in 2012, we’ve experienced growth in new industries with customers who are benefiting from the advancements ClusterControl has to offer. In addition to reaching new highs in ClusterControl demand, this past year we’ve doubled the size of our team allowing us to continue to provide even more improvements to ClusterControl. Watch this short video to see where ClusterControl stands today.